Am I a Good Candidate for Dental Implants in Oklahoma City? If you’re missing one or more teeth, then you’ve already experienced a change in your ability to eat certain foods, your confidence and possibly, your pronunciation or words. These have served as major inconveniences that you’d like to correct, so how do you go about it? Your local dentist recommends dental implants in Oklahoma, and as you continue reading, he’ll explain how he’ll determine whether you’re a good candidate for this restorative procedure. 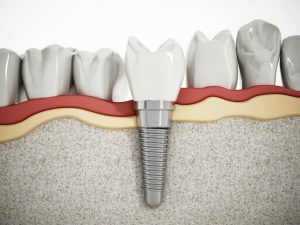 Dental implants are surgically placed posts that are made from titanium, a very strong and durable material that fuses with the bone mass beneath your gums. In doing so, the implant acts as the root of your missing tooth. Usually a two-visit procedure, once the post is placed in the jawbone, your dentist in Oklahoma City will then attach an abutment, which is a piece that connects your implant to either a crown or bridge (depending on whether you have one or more missing teeth). Once your jaw and gums have healed from the initial surgery, you will return to your dentist’s office to have either the crown of bridge attached, restoring your full function. Before any work is done, your dentist will take X-Rays to evaluate whether you have enough bone density to support the implant process. This is important because the success of the procedure depends on how well the implant seats into your existing bone mass. If this initial step is not established, you could be left with a wiggly implant that could eventually fail. Why are Dental Implants the Best Option for Full Restoration? The dental implant process is the most reliable for restoring your smile and the full function of your teeth because it goes to the heart of the problem – the root. By replacing the missing root, it stops any bone degeneration that could occur. Tipping – This refers to the shifting of the teeth around a missing tooth because of the vacated space. Super Eruption – A super eruption is a vertical movement that occurs when the tooth that’s directly above or below a vacated area begins to extend into the space where the missing tooth is supposed to be. These alignment issues can lead to other problems like malocclusion (irregular bite) and misalignment of your teeth. The great news is that you’re suffering doesn’t have to continue. The first step is to reach out to your dentist in OKC to schedule a consultation to find out if the procedure is right for you. Then, you can soon enjoy life without limitations with a fully restored smile! Dr. Joe Isaacson is an award-winning dentist who has remained committed to striving for excellence since he first entered dental school at the University of Oklahoma College of Dentistry. Since then, he’s gone on to be rated as the #1 Dentist by Doctoroogle.com and one of the top 50 dentists in Oklahoma. Dr. Isaacson can be reached for more information about his services through his website.